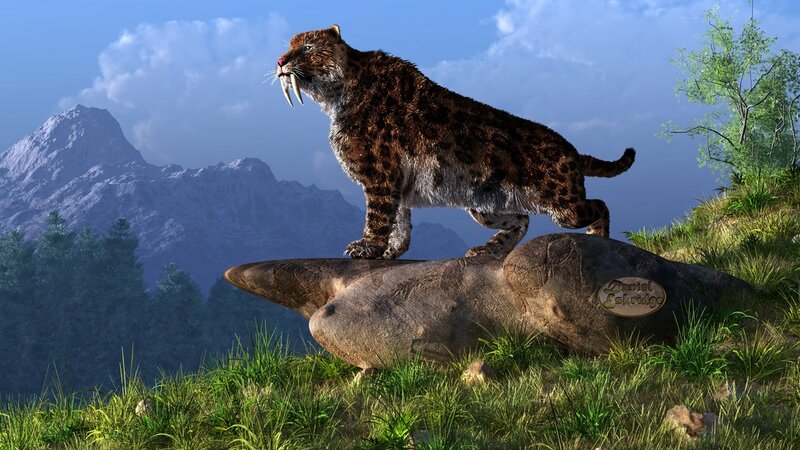 Smilodon fatalis ranged widely over North and South America during the Pleistocen e epoch. During this time, glaciers came and went resulting in a series of ice ages disrupted by warmer periods. Throughout these ice ages, global temperatures were cooler and drier than today (BBC Nature 2014). However, the late warmer period marked when Smilodon fatalis, or the saber-tooth tiger, arose as a prime predator. During this epoch (40,000-11,000 years ago), tar pits were formed from heated asphalt stretching over large areas and then being covered with leaves and various debris (Page Museum 2014). Many herbivores and other species became stuck in the asphalt; thus, the carnivorous saber-tooth tigers were attracted to the pits and subsequently got caught in the asphalt. The asphalt allowed for excellent preservations of their bones allowing scientists to understand their habitat in Southern California (Page Museum 2014). Specifically, the saber-tooth tiger occupied the geographic locations of South America on the west side of the Andes, including Chile, Ecuador and Peru (Prieto et al., 2010). They were also found in North America, primarily in Rancho La Brea in California where over 2,000 individual remains have been found (Prehistoric Wildlife 2011). Today, Smilodon fatalis is the California state fossil as a result of the numerous remains found in the tarpits in the state. Saber-tooth tigers lived in a variety of habitats such as forests, shrubby regions and grasslands because the vegetation provided the food and shelter for the herbivorous prey (Prehistoric Wildlife 2011). Common prey of the prehistoric cat included large herbivores such as the ancient bison (Bison antiquus) as well as the occasional small American mastodons (Mammut americanum). Other species living in this area include the dire wolf (Canis dirus), yesterday’s camel (Camelops hesternus), Harlan’s ground sloth (Paramylodon harlani), western horse (Equus occidentalis) and other various species (Page Museum 2014). For more information on La Brea Tar Pits, visit the History Channel or the Page Museum. To continue on the journey, visit Adaption next! To return to the Smilodon fatalis homepage, click here.